It’s only been 6 months?! It feels like so much longer! But that’s not a bad thing… I think I feel like that because blogging and filming videos for my Youtube channel feels so natural, it’s like what I should’ve been doing for so much longer than I actually have.. So, 6 months in and I thought I’d write a post to more formally introduce you to me, what my highlights have been since I started blogging and filming and also what I’ve learnt on my journey so far. I’ve been immersed in all things beauty for as long as I can remember; I think it was at the age of 13/14 that my mum first introduced me to a basic skincare regime to help control my teenage breakouts and it was even before this time that I began wearing make-up. I haven’t looked back since and now, I don’t go a single day without some form of skincare or make-up (not even when in hospital after giving birth… judge that as you will). I find it hard to pinpoint exactly why this industry is so important to me, why it lifts me so much and why I’m so passionate about it but one thing I can say is that, from this young age, I started to appreciate the feeling of looking after myself, pampering and ‘making an effort’ that skincare and make-up gave me. I’m a very reflective, analytical person and I’m hugely interested in things like emotional intelligence and psychology. Coming from this angle, I think one of the reasons I love my job so much is because of the impact it has on my/our attitude: your mood, your start to the day, your preparation for a night out/event, your healing after trauma… Almost every which way you look at the health and beauty industry, it represents ‘me time’, it’s a treat, it’s about feeling good, healing, improvement and positivity. Perhaps that’s why, after a long hard week at work, I know that a Friday afternoon stroll to Space NK will flip my mood entirely and I will walk back out with my mojo firmly in tact again. After A-Levels it was clear to me that University wasn’t my thing (it didn’t spark my interest or get me excited in anyway) but beauty did, so I went to college to do an HND in Beauty and Health Therapy Management. During my course I started working at a spa in the Hilton Hotel near me, as well as working freelance as a make-up artist for events and theatre productions. Once I’d graduated, I worked at the Hilton full time and whilst there, I qualified as a National Trainer for a company called Hydrotherm, working around the country training other therapists in specialist and advanced massage techniques. This was my first taste of teaching and I LOVED it but it wasn’t until some years later, after establishing my own salon business that I decided to become a lecturer in specialist make-up and beauty therapy. 11 years later and I have a wonderful balance of family life, teaching and freelance make-up artistry. Initially I wanted my blog to be about everything that makes me me but I soon learnt that blogs don’t work like that and writing about all of my interests and passions would never be realistically achievable or interesting to many people. So I narrowed down my content to what it is now: all things beauty, make-up and skincare. Growing a blog without regular, consistent use of social media is near on impossible. You start by writing for yourself but very quickly, something happens and you want to see others reading and reacting to your material too. So sharing your content (and doing so multiple times across multiple platforms!) is essential if you want others to see and interact with your work. I use Facebook, Instagram, Pinterest, Twitter, Blog Lovin’, Tumblr, YouTube and LinkedIn. Posting on social media takes FOREVER! For such a long time I wasn’t getting much traffic to my site because I didn’t fully understand (or make the time for!) sharing sufficiently on social media. And to this day, I’m still not doing it like I want to but I can only do as much as my life allows. But schedulers help, big time. I’m a fan of Crowdfire and Tailwind but I don’t use either to schedule posts on my Facebook page (it annoys me that they don’t include a preview of your blog post/video when you add a link to your post). So I schedule my Facebook posts on my Facebook page only. This all saves me time but still, I’m scheduling posts from 3 different locations! You start to watch the numbers. Followers was not why started doing this but since the day I sent a preview of my site to my mum and a friend for approval (before I went live), you can’t help the ‘want’ for others’ approval as well. So you tend to check in with your Facebook page likes, Intagram and Twitter followers, views on your blog, re-pins on your Pinterest, subscribers on your Youtube channel, etc. like, every day. Surely I’m not the only one?! Plus, it helps you get a feel for what’s working and what isn’t. I started a blog and I had no intention to do videos. But the blog gave me confidence to try and then suddenly I had a YouTube channel as well. Where I am now isn’t quite where I thought I’d be; it’s so much better than that. The best things that blogging and filming have given me are confidence, identity, purpose and a revitalized passion for what I do. I’m full to the brim with ideas of what I want to try, research and share. I’m also enjoying learning from others, connecting with people who share this passion and evolving along the way. It’s been a steep learning curve and what I initially thought I would be doing with my blog has evolved to something I’d never anticipated. But equally, all the ‘stuff’ I hadn’t bargained for is actually stuff that really interests me, that I want to learn more about and do. I have two highlights from my first 6 months with Lady Eversmith that I’d like to share with you; they’re only small but to me, they’re so exciting! 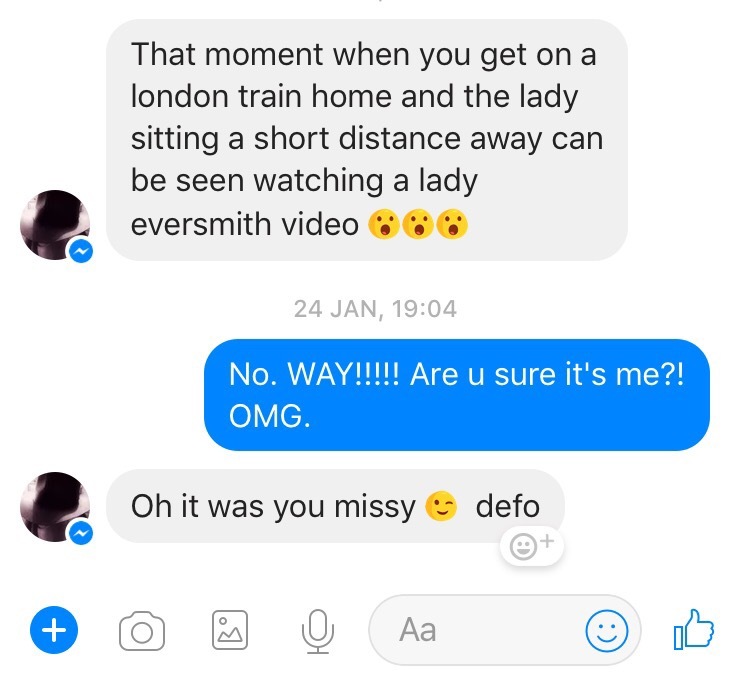 Back in January I had a message from my brother-in-law (who works in London) to say that he’d just got on the train and a lady sitting near him was watching one of my videos on her phone… this totally made my year! To hear that someone who was definitely a stranger was watching my video was just the best feeling! I was beside myself to know for sure that my content was reaching beyond just friends and family already. And lastly, another highlight for me that wouldn’t ever have happened without Lady Eversmith was to have my absolute idol, Lisa Eldridge wish me happy birthday! I have been such a fan of her work, her principles (and now her book!) for years… She is a total pro and such a beautiful one at that. If you’re a blogger/vlogger too, how was your first 6 months? Sorry Hun, what do you mean? I could never be without it! It’s such a big part of my life!